The history of the 4th District Court of Appeal mirrors the history and growth of Florida. From 1845, the year Florida became the 27th state of the United States, until 1956, the Florida Supreme Court was Florida’s only appellate court. Clearly, Florida had grown tremendously during the passage of those one hundred and eleven years. As such, in 1956, three District Courts of Appeal were established; the First District in Tallahassee, the Second in Lakeland, and the Third in Miami. With continuing population growth, the greater the increase in the number of appeals filed. 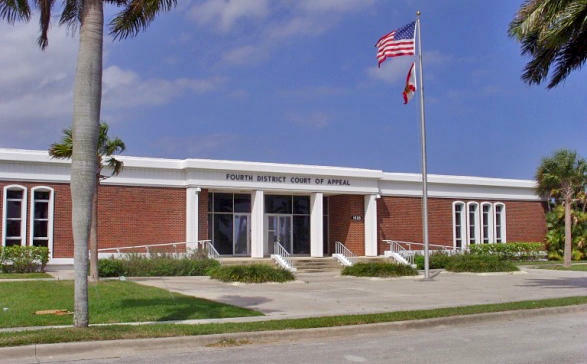 Hence, in 1965 the Fourth District Court of Appeal was created and located in Vero Beach. At that time, the 4th. DCA included Orange and Brevard counties to the north and southward to include Broward County. In 1967, the Legislature relocated the Fourth District Court of Appeal to West Palm Beach where, in 1970, the Court moved to its permanent site located on Palm Beach Lakes Boulevard about one mile east of I-95. In 1979, due to Florida’s continuing population growth, the Florida Legislature chose to revamp the Courts of Appeal jurisdictions again. Parts of the First, Second, and Fourth Districts became the Fifth District Court of Appeal in Daytona Beach. This action reduced the area. However, population growth continues to add a greater burden upon the Fourth District Court of Appeal which hears appeals from the Fifteenth, Seventeenth, and Nineteenth Judicial Circuits, known to most as Palm Beach, Broward, St. Lucie, Martin, Indian River, and Okeechobee Counties. In 1965, there were only three appellate judges; today there are twelve. The Fourth District Court of Appeal’s caseload was 480 cases at its inception to 4846 cases filed in 2013. What will happen in the next fifty years? For a list of former 4th DCA Judges click here.